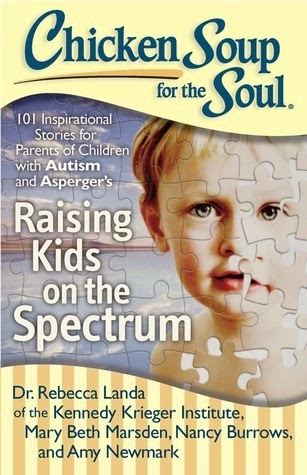 With its 101 stories from other parents and experts, this book will comfort, encourage, and uplift parents of children with autism and Asperger’s.If you are the parent of a child – from newborn to college age – with autism or Asperger’s, you will find support, advice, and insight in these 101 stories from other parents and experts. Stories cover everything from the serious side and the challenges, to the lighter side and the positives, of having a special child on the autism spectrum. Another amazing book from Chicken Soup. As I've said on my other reviews for Chicken Soup, I'm a huge fan. This book brought tears to my eyes. I have two children. At times I think, "Wow this is tough." Boy did I have an eye opener for sure after reading these stories. I was one of those people who would see a child with a special needs and I had sadness for both the child and the parent. I thought, "This parent has a long road ahead of them," but in most cases they don’t want the sympathy. To this parent with a special needs child this is normal life. They do what they can and what is best at the moment. Living day to day and in one part of the book there was a mother who stated, "Don’t all children have "Special" needs? Some need a night light, some need speech therapy, some need encouragement some need a pat on the back, some need wheel chairs, some need help with homework. How true and right on the button was she. That really touched me in a big way. This book made me also see a bit clearer on lots of different situations. To be honest I don’t have just one favorite story, I loved them all. This was very inspirational for me. Disclosure: All opinions are my own. I received Chicken Soup for the Soul: Raising Kids On The Spectrum at no cost for the purpose of this review. No other compensation was received. Get Smooth and Moisturizing Skin with Eucerin!